Black Rebel Motorcycle Club On World Cafe : World Cafe Hear the band perform a stripped-down session, recorded at the Harley-Davidson Museum in Milwaukee. Recorded live at the Harley-Davidson Museum in Milwaukee, Black Rebel Motorcycle Club recently performed a special stripped-down session for World Cafe. 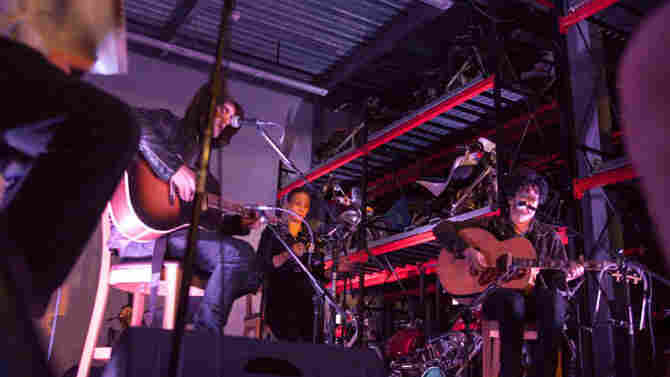 The band appears as a trio, playing songs from its latest album, Specter at the Feast. In 2010, lead singer Robert Been's father Michael died of a heart attack while Black Rebel Motorcycle Club was on tour; this is the group's first release since his death. Michael Been was the bass player and singer for the band The Call. He'd become extremely involved with his son's band, and was even mixing its live shows right up until his passing. Hear Black Rebel Motorcycle Club cover The Call's "Let the Day Begin" in tribute to Michael Been, as well as a few other new songs from Specter at the Feast. Thanks to our affiliate 88Nine Radio Milwaukee for helping with this interview and performance.